Heavy Metal fans, you could win a trip to see Korn & Rob Zombie, Slipknot & Marilyn Manson, Shinedown, Disturbed & Breaking Benjamin, Slayer or the Korn & Breaking Benjamin tour! Six runner up winners will get tickets to shows in their local area, too, so be sure to get your entry in! Return of The Dreads Tour (Korn & Rob Zombie) Grand Prize consisting of one Rock Flight which includes two (2) reserved tickets to see Return of The Dreads Tour (Korn & Rob Zombie) at Mandalay Bay in Las Vegas, NV scheduled to take place on July 30, 2016; round-trip, coach class air transportation for two (2) from the airport nearest Grand Prize Winner's home within the U.S. or Canada to Las Vegas, NV departing on July 29, 2016 and returning on August 1, 2016; one (1) double occupancy standard hotel room for two (2) nights / three (3) days; a 200.00 cash card to use toward ground transportation; and (1) $100 Hot Topic gift card. Approximate Retail Value of Return of The Dreads Tour (Korn & Rob Zombie) Grand Prize is: Two Thousand One Hundred Fifty Dollars ($2150), depending upon winner's point of travel origin and airfare fluctuations at the time of taking the trip. Slipknot & Marilyn Manson Tour Grand Prize consisting of one Rock Flight which includes two (2) reserved tickets to see Slipknot & Marilyn Manson Tour at Concord Pavilion in Concord, CA scheduled to take place on August 13, 2016; round-trip, coach class air transportation for two (2) from the airport nearest Grand Prize Winner's home within the U.S. or Canada to Oakland, CA departing on August 12, 2016 and returning on August 14, 2016; one (1) double occupancy standard hotel room for two (2) nights / three (3) days; a 200.00 cash card to use toward ground transportation; and (1) $100 Hot Topic gift card. Approximate Retail Value of the Slipknot & Marilyn Manson Tour Grand Prize is: Two Thousand One Hundred Thirty Nine Dollars ($2139), depending upon winner's point of travel origin and airfare fluctuations at the time of taking the trip. The Carnival of Madness Tour (Shinedown) Grand Prize consisting of one Rock Flight which includes two (2) general admission tickets to see The Carnival of Madness Tour (Shinedown) at FirstMerit Bank Pavilion in Chicago, IL scheduled to take place on August 16, 2016; round-trip, coach class air transportation for two (2) from the airport nearest Grand Prize Winner's home within the U.S. or Canada to Chicago, IL departing on August 15, 2016 and returning on August 17, 2016; one (1) double occupancy standard hotel room for two (2) nights / three (3) days; a 200.00 cash card to use toward ground transportation; and (1) $100 Hot Topic gift card. Approximate Retail Value of The Carnival of Madness Tour (Shinedown) Grand Prize is: Two Thousand One Hundred Dollars ($2100), depending upon winner's point of travel origin and airfare fluctuations at the time of taking the trip. Disturbed & Breaking Benjamin Grand Prize consisting of one Rock Flight which includes two (2) general admission tickets to see Disturbed & Breaking Benjamin at White River Amphitheater in Auburn, WA scheduled to take place on August 21, 2016; round-trip, coach class air transportation for two (2) from the airport nearest Grand Prize Winner's home within the U.S. or Canada to Seattle, WA departing on August 20, 2016 and returning on August 22, 2016; one (1) double occupancy standard hotel room for two (2) nights / three (3) days; a 200.00 cash card to use toward ground transportation; and (1) $100 Hot Topic gift card. Approximate Retail Value of the Disturbed & Breaking Benjamin Grand Prize is: Two Thousand One Hundred Dollars ($2100), depending upon winner's point of travel origin and airfare fluctuations at the time of taking the trip. 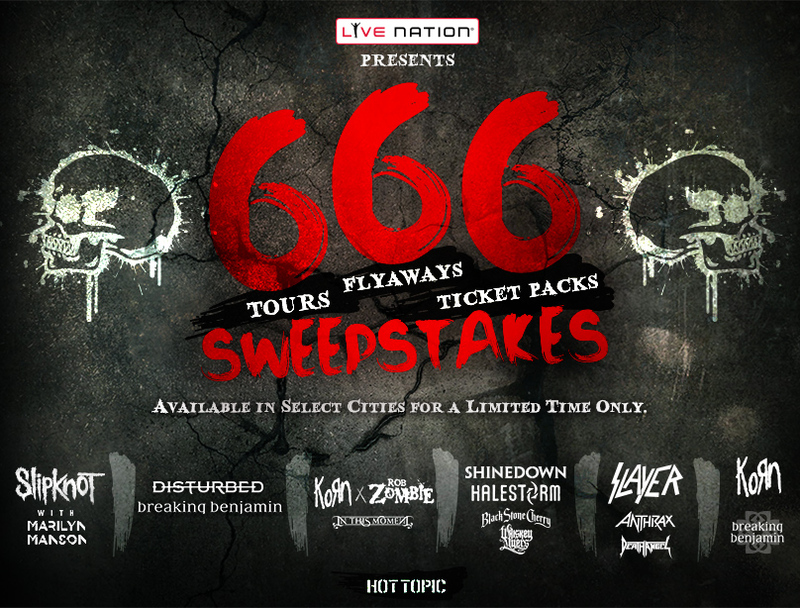 Slayer Grand Prize consisting of one Rock Flight which includes two (2) general admission tickets to see Slayer at The Fillmore Denver in Denver, CO scheduled to take place on October 10, 2016; round-trip, coach class air transportation for two (2) from the airport nearest Grand Prize Winner's home within the U.S. or Canada to Denver, CO departing on October 9, 2016 and returning on October 11, 2016; one (1) double occupancy standard hotel room for two (2) nights / three (3) days; a 200.00 cash card to use toward ground transportation; and (1) $100 Hot Topic gift card. Approximate Retail Value of the Slayer Grand Prize is: Two Thousand One Hundred Dollars ($2100), depending upon winner's point of travel origin and airfare fluctuations at the time of taking the trip. Korn & Breaking Benjamin Grand Prize consisting of one Rock Flight which includes two (2) reserved tickets to see Korn & Breaking Benjamin at MidFlorida Credit Union Amp in Tampa, FL scheduled to take place on October 11, 2016; round-trip, coach class air transportation for two (2) from the airport nearest Grand Prize Winner's home within the U.S. or Canada to Tampa, FL departing on October 10, 2016 and returning on October 12, 2016; one (1) double occupancy standard hotel room for two (2) nights / three (3) days; a 200.00 cash card to use toward ground transportation; and (1) $100 Hot Topic gift card. Approximate Retail Value of the Korn & Breaking Benjamin Grand Prize is: Two Thousand One Hundred Dollars ($1000), depending upon winner's point of travel origin and airfare fluctuations at the time of taking the trip. Six (6) First Place Prizes each consisting of six (6) general admission or reserved tickets to winner's choice of one (1) participating concert in the 666 Tour Series. Approximate Retail Value of each First Place Prize is: One Hundred Eighty to Four Hundred Fifty Dollars ($180 to $450), depending on the concert selected. HINT: Be sure to check the rules before entering because you can only enter within certain dates, depending on which trip you'd want to win. See the rules for details. This Sweepstakes ends on 08/12/16 and you can ENTER ONCE to win.